Yemen has a rich tradition of agriculture, stemming from the South Arabian kingdoms through the Islamic era. In the 10th century the Yemeni savant al-Ḥasan al-Hamdānī referred to his homeland as al- Yaman al-khaḍrā’ (the verdant Yemen) due to its agricultural wealth. Several important treatises and almanacs exist from the Rasulid era (13th-15th centuries). 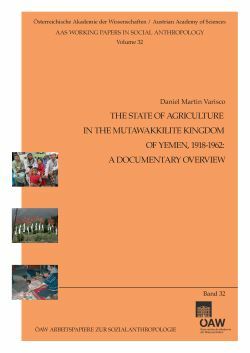 Yemeni scholars, anthropologists and agricultural experts have written about Yemen’s agriculture in the past half century, but less is known about the state of agriculture during the Mutawakkilite Kingdom of Imams Yaḥyā and Aḥmad during the 20th century. This study draws on Arabic sources, foreign travelers and the report of a 1955 FAO mission to Yemen in describing the role of agriculture and cultivated crops in the area ruled by the two imams between 1918 and 1962. The information in these sources is here made available in English.